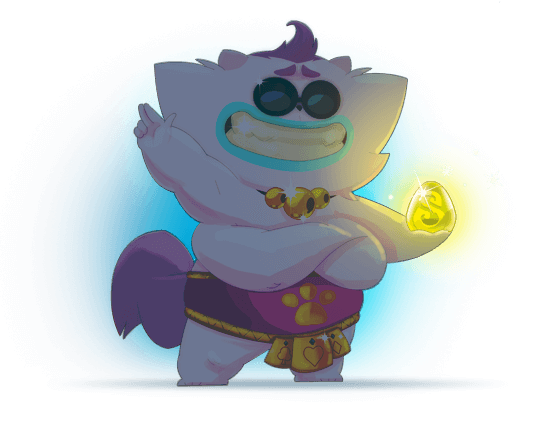 Reminder for those who don't know what a Dofus is: A Dofus is a dragon egg that gives its owner extraordinary powers. welcome to Krosmaga, My kittens I've been expecting you! You were all that was missing. You know, nothing makes me quiver as much as knowing that you're soon going to discover my game. It will probably be the last time I give you advice, so pay attention! 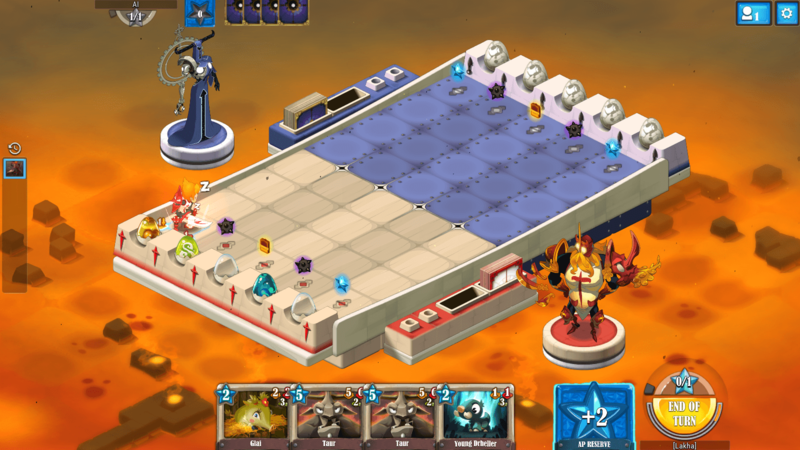 In Krosmaga, you have a double objective: you have to capture your opponent's Dofus* while protectingyour own! That's not too complicated. Not just a card game! 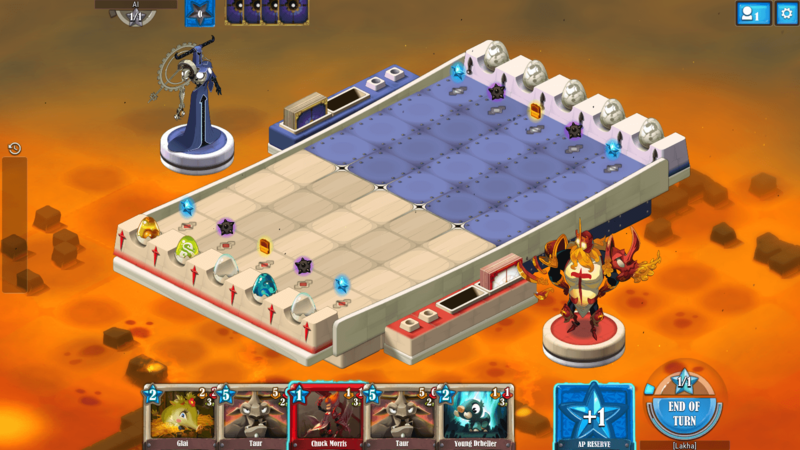 To protect your Dofus, you'll have to put your deck together in a strategic way. Minions (to summon an army to help you) and Spells (to... uh... cast spells)! Can you feel the pressure rising? Wait until you see the epic challenges waiting for you before you panic! Members of the same family can work together to create ultra-powerful effects. The rarity of a card influences its creation cost and the number of copies of it allowed in your deck. For example, since the Male Gobball is Uncommon, it can be present in your deck 3 times. Minions have various effects that can be triggered when they're played, when they attack, when they die, etc. Once cast on the game board, Minions live their life. They advance and they attack at the end of their turn! The spells can improve, move, and transform Minions, as well as inflict damage on them, etc. Each god has specific powers that allow them to cast spells. You'll receive an amount of AP equal to the turn number: on turn 1, you get 1, and on turn 2, you get 2, and so on. And it's these AP that will allow you to play your cards.So choose the cards that you will play carefully, depending on their AP cost! These are the cards you can play. 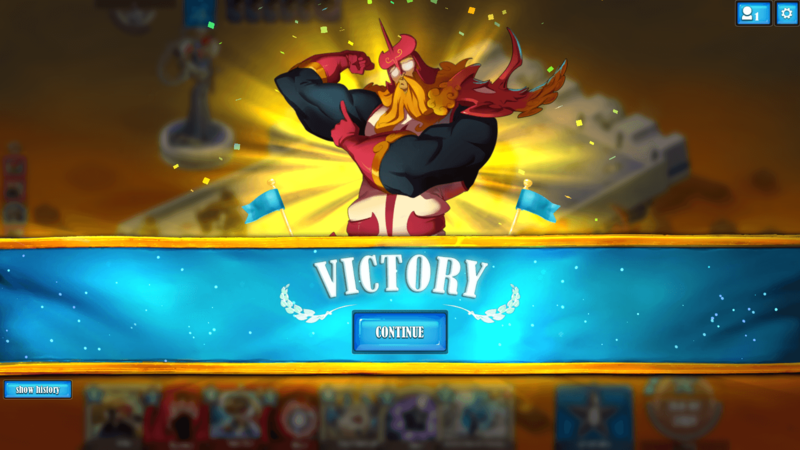 You draw a new card at the start of each turn. You can have up to 10 cards in your hand, and not a single one more. If you cannot draw an extra card, it will go directly into your discard pile! All of your actions and your opponent's are noted here. It can always be helpful if you're the forgetful type and you're wondering "Have I already played this card?". Each Dofus has 5 Health points. Once you manage to inflict 5 damage on an enemy Dofus, it's destroyed. Like you, your enemy has three real Dofus and two fake ones. They're all hidden, so you'll need to guess which ones are the real Dofus!You'll need to destroy two real enemy Dofus to win the game. 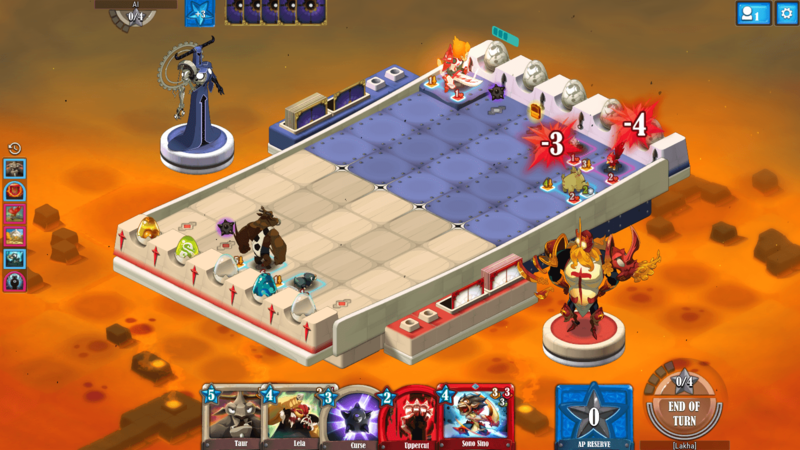 Of the five Dofus present on your side of the board, only three are real Dragon* eggs. A sneaky way to lure your opponents in, no? Protect your real Dofus and keep enemy Minions from attacking them! *The fake Dofus are the transparent ones. Note that in Krosmaga, you embody a god! The one you choose will grant you very specific powers: their spells, but also certain creatures that are faithful to them. Choose wisely. 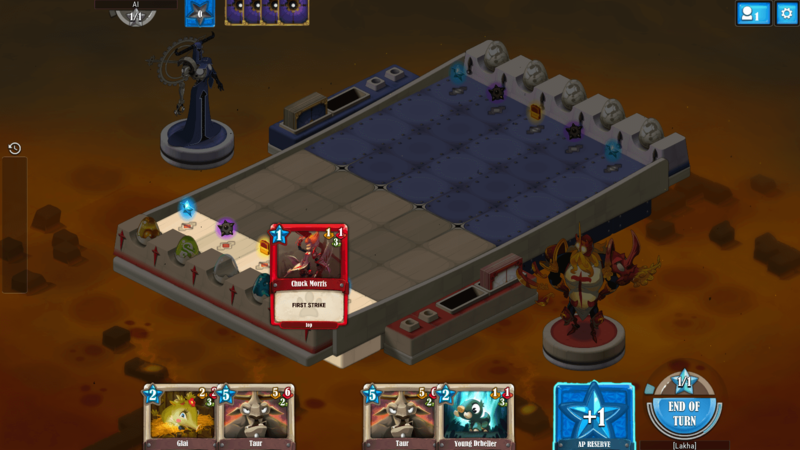 At the start of the game, your deck contains 45 cards. 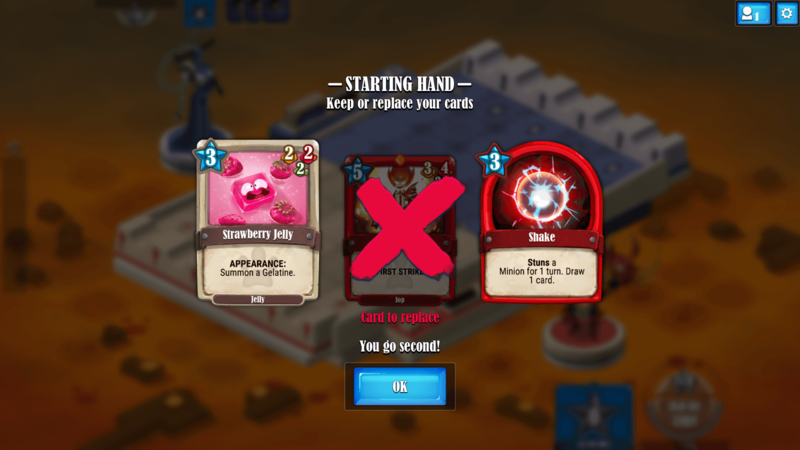 Each turn, you draw a card from it and add the card to your hand. When you play a spell card, or when one of your Minions dies on the game board, the card goes to your discard pile! Play your Minion cards: they'll come to life on the game board. Once placed, the Minion will automatically advance and attack enemy creatures. Prisms are placed on the battlefield. 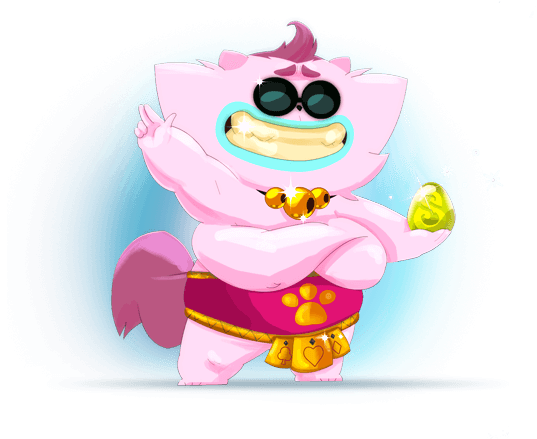 If one of your Minions walks over a prism, you get a bonus: you gain one AP in your reserve, you receive a card allowing you to inflict damage on a Dofus, or you draw a card. Prisms reappear when they have all been collected. You have an AP reserve that you can use whenever you wish to play the cards in your hand. Fill the reserve by collecting prisms on the battlefield. If you play second, you will be given an extra card and 1 AP will be added to your reserve. Each turn, you'll have an amount of AP equal to the turn number. The first turn, with 1 AP, the Chuck Morris is perfect! You can also decide to use the AP in your reserve to play a card that costs 2 AP, like the Young Drheller. Minions are inactive for the turn they're placed. Once they wake up (on the following turn), they live their lives and will attack enemy Minions or Dofus. Spells, however, have an immediate effect. As soon as they're played, they act! Once your turn is over, don't forget to click on the "End of turn" button. Once two Minions are in front of each other, they fight and inflict damage on each other equal to their attack points. A Minion that makes it all the way to an enemy Dofus can attack it. 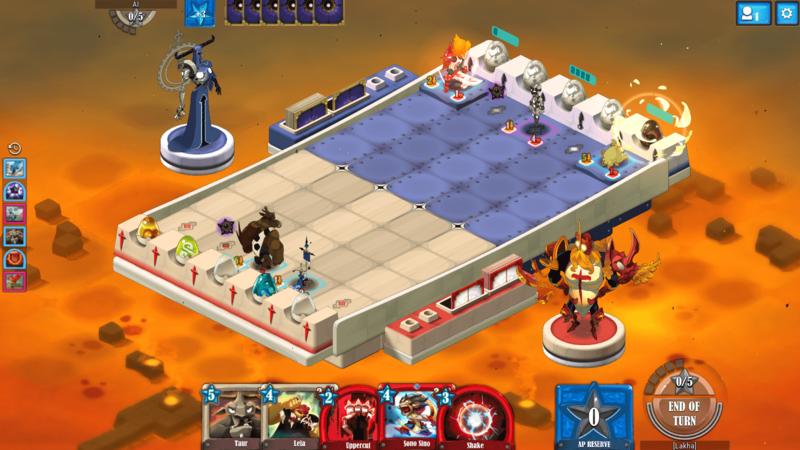 A Dofus that loses 5 Health points is destroyed. Destroy two real enemy Dofus to win the game.